Once trust fund punks lose their savings they are reduced to riding a fixed gear bike, the same means of travel they had when they were in middle school. Their current bike build is actually less sophisticated than the ones they grew up on, but hipsters will always sacrifice the convenience of brakes for fashion. One of the most pretentious of all hipsters, fixies are primarily located in Williamsburg, Portland, San Francisco and wherever else snobs congregate these days. They tend to hang out at cafés, bike shops and anywhere else they can turn their nose at other hipsters. Usually enrolled in some form of printmaking or photography at their art school, the fixie spends more time complaining about things rather than creating them. One should not confuse a nonathletic fixie with actual racers or bike messengers. 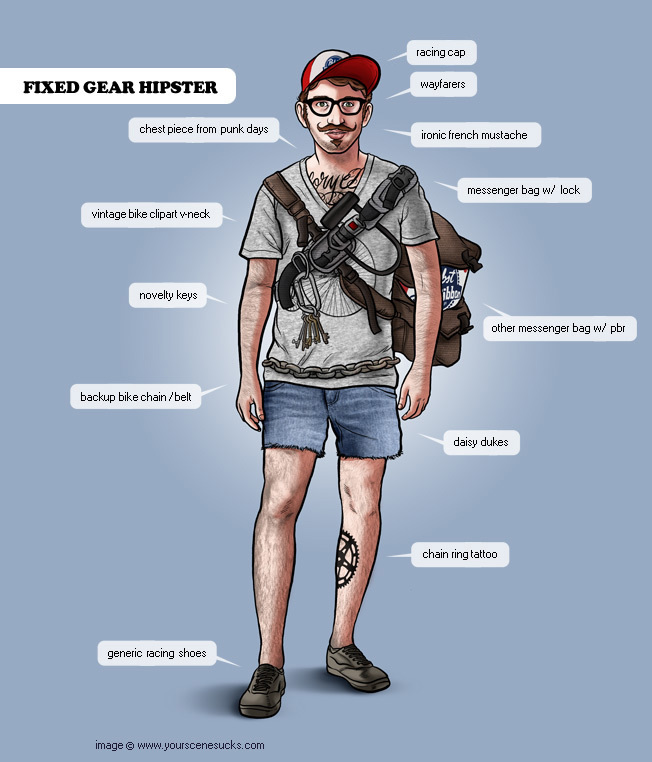 The latter can spot a fixed gear hipster from a block away, recognizing their bike as just another fashion accessory until they move onto the next trend. Usually a vegan, the street smart cyclist weighs no more than 100 pounds when soaking wet and gets his sole caloric intake from PBRs and plants. A fixie longs for a Bianchi Pista with drop handlebars but instead will custom order their ride from Urban Outfitters using their employee discount. The Fixie likes to tell everyone they are saving the world by having “one less car” but ultimately they just can't afford one.